Donegall Pass, is a small community in inner-city Belfast just to the south of Belfast city centre. This community of around 1,000 people lives in an area bounded by the Ormeau Road (west), Bankmore Street (north), Dublin Road and Shaftesbury Square (east) and the Central railway line (south). 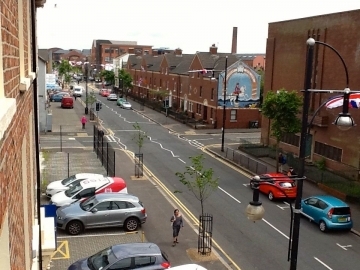 Donegall Pass along with the Markets, and Sandy Row/Lower Donegall Road make up the Shaftesbury ward which falls within the 10% most deprived wards in Northern Ireland. Donegall Pass Community Forum is the primary representative body for the inner city ‘urban village’ that is Donegall Pass and run the Communities in Action (CiA) project here. We have set up one CiA focus group with local residents. The community group has identified stress, anxiety and money worries as major issues to emerge from focus group discussions. More information on this community research and findings will follow over the coming months. If you want to find out more about the CiA programme in Donegall Pass, contact the CFNI project officer, Geraldine Wilkins.